1769-1837. Born on 30 July 1769, he was the son of the Rev. Hon. Richard Byron, rector of Haughton, Durham, and of his wife Mary Farmer. He was the nephew of Vice-Admiral Hon. John Byron, and the cousin of Captain George Anson Byron. Byron’s name was initially entered to the books of the Proserpine 28, Captain George Anson Byron, in October 1781, and he first went to sea with this officer aboard the newly commissioned Andromache 32 at the start of 1782, which vessel went out to the Leeward Islands and fought at the Battle of the Saintes on 12 April. After the Andromache returned to England with despatches she was present at the Relief of Gibraltar on 18 October. 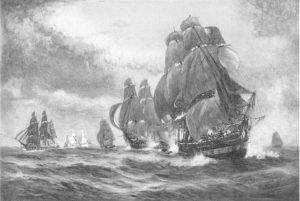 Byron was rated midshipman on 2 June 1784 when aboard the Druid 32, again commanded by his cousin, and from March 1785 by Captain Joseph Ellison, with the frigate being engaged in the prevention service off Devon and Cornwall. He next rejoined Captain Byron aboard the Phoenix 36 in early 1789, going out to India with the Cornwallis Expedition. Subsequent service was aboard the Crown 64, Captain James Cornwallis, bearing the broad pennant of Commodore Hon. William Cornwallis on the same station, and thereafter with the latter officer aboard the Minerva 38. Commissioned lieutenant on 1 October 1792, he joined the Perseverance 36, Captain Isaac Smith, and returned home aboard that vessel to be paid off in July 1793. In October 1793 Byron joined Rear-Admiral Benjamin Caldwell’s flagship Impregnable 98, Captain George Westcott, in which ship he fought at the Battle of the Glorious First of June in 1794. His next move was to the Channel fleet flagship Queen Charlotte 100, Captain Sir Andrew Snape Douglas, in which he was present at the Battle of Lorient on 23 June 1795. In September 1797 he moved to the Doris 36, Captain Rt. Hon. Viscount Ranelagh, serving on the Irish station for a month before leaving that vessel. He next became flag-lieutenant to Rear-Admiral Sir Hugh Cloberry Christian who had been appointed commander-in-chief at the Cape. Taking passage with the rear-admiral aboard the frigate Virginie 44, Captain Anthony Hunt, they arrived at the Cape in January 1798 where Christian later shifted his flag to the Sceptre 74, Captain Valentine Edwards, and in May to the Tremendous 74, Captain John Clarke Searle. There followed a brief spell for Byron in command of the brig Cornwallis, to which he was appointed on 22 June, and in which he returned home with despatches. His next command was the prize Rosario 18, which he joined on 12 August 1801, returning to Falmouth from a cruise in December, then going out to Jamaica to keep a watch on French movements on that station, and returning to Plymouth on 23 May 1802 with $20,000 for the London merchants. In the meantime he had been posted captain with seniority from 29 April 1802. During the autumn of 1803 Byron fitted out the Inconstant 36 at Chatham, but he was disappointed in the command of her, this honour going to Captain Edward Stirling Dickson. He then assumed command of the Sea Fencibles on Anglesey. It was not until 11 February 1810 that Byron achieved his next active posting, being appointed to the recently commissioned eighteen-pounder frigate Belvidera 36, and serving in the protection of the Greenland fisheries, in the North Sea and off the coast of Norway. On 22 July 1810 seven boats from the Belvidera and the Nemesis 28, Captain William Ferris, captured the Danish gun-boats Balder 8 and Thor 8 in a fjord near Studtland on the Norwegian coast. In October 1810 the Belvidera sailed for North America, and during 1811 served as flagship to Rear Admiral Herbert Sawyer at Halifax. On 23 June 1812, being ignorant of the United States declaration of war, she was chased by an American squadron consisting of the President 44, United States 44, Congress 38, and the sloops Hornet 18, and Argus 16. Byron was wounded to the groin during the engagement when a gun fell on him, but he skilfully managed to escape his pursuers. Whilst returning to Halifax his command captured three American vessels, but these were later released by Rear-Admiral Sawyer. On 5 July the Belvidera returned to sea with the Africa 64, Captain Philip Broke, and Aeolus 32, Captain Lord James Townsend, capturing the American brig Nautilus 14 off Sandy Hook eleven days later. The same evening, 16 July, the squadron fell in with and began a pursuit of the Constitution 56, and despite kedging, the Belvidera was only able to engage at long range by firing her chasers. Three days later the Constitution was able to break clear and escape. The Belvidera thereafter remained on the American coast, capturing the schooner Lottery 6 off Lynhaven Bay on 8 February 1813, following which Byron received a letter of thanks from the captain of the American frigate Constellation 36, Captain Charles Stewart, for his care of the mortally wounded schooner’s captain. He also took the Vixen 18 on Christmas Day 1813, together with a host of other vessels. After the Belvidera was paid off at the end of 1814 Byron did not see any further active service. On 4 June 1815 he was nominated a C.B. He became a rear-admiral on 10 January 1837, but died the same year on 2 September at the Bush Hotel, Southsea whilst travelling to the Isle of Wight with his family for the benefit of his health. He was buried five days later in the grounds of the Portsmouth garrison chapel. Byron married Sarah Sykes, the sister of Vice-Admiral John Sykes, on 23 September 1801 at Stoke Damerel, Devon and the couple had four sons. The oldest son, Richard, rose to the rank of commander, the second son, James, served in the Army, the third son, John, took holy orders and the fourth son, William, studied at Cambridge and became a clerk in the East India Company audit office. Byron’s address in his will was given as Leatherhead, Surrey. He was a respected and skilled officer.